Customer just bought the house. 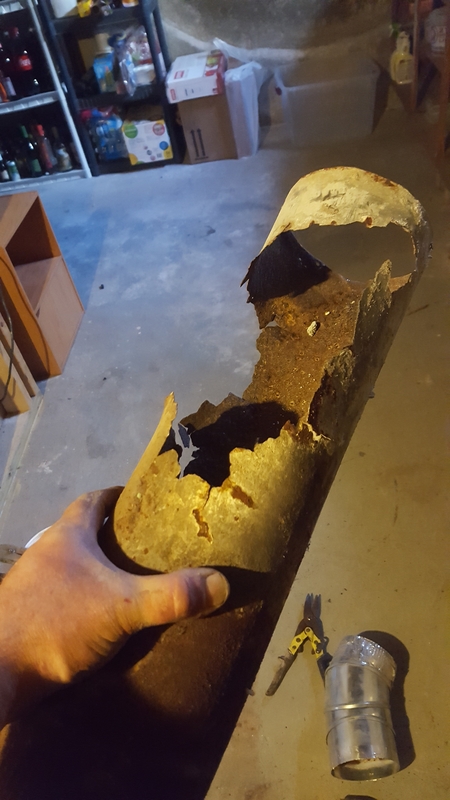 Brand new flue pipe by the previous owner. Photo of pipe that was in the cinder block foundation wall going into chimney. Was it by any chance an orphaned water heater? I think your customer needs to speak with his lawyer. Boiler only. Customer found paying me to install 2 feet of smoke pipe not worth lawyer time. I am sure it would be different if someone died. I would actually consider running a bit of stainless through there. I recommended that they get the chimney lined. The stainless liner would then extend through the basement wall. The pipe I show was not changed when the other pipe was changed.